I received a report over the weekend of Green June Beetles (Cotinus nitida) (GJB) buzzing a wedding in a park in southwest Ohio. 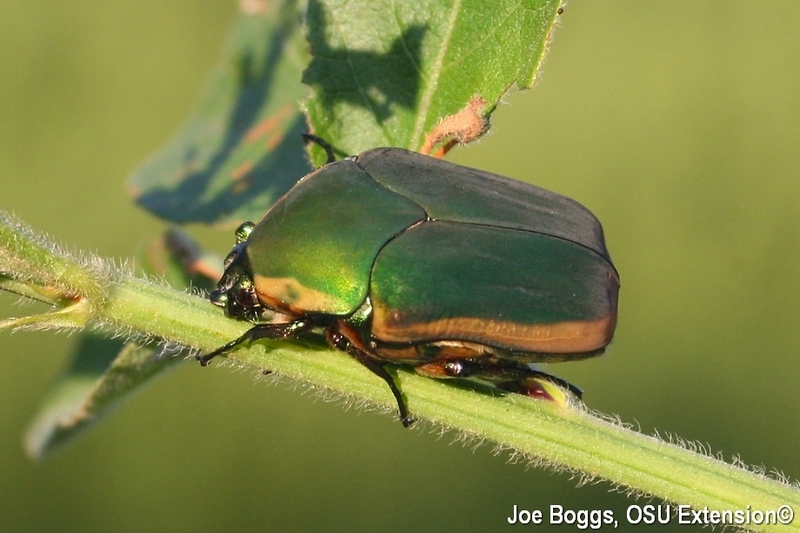 These large, metallic green beetles tend to emerge en masse. Their large size, coupled with an audible "buzzing" sound, and low level flight plan (cruising at about 2-3'), may induce panic with individuals unfamiliar with this insect. Indeed, there have been reports of GJB causing picnickers to flee feasts, pool loungers to lunge, and golfers to fail to stay the course. The beetles have great entertainment value! Historically, the highest populations of these buzz-bombing beetles have occurred in southern Ohio. However, in recent years large numbers of beetles have been seen in the central part of the state and points north. In 2006, Dave Shetlar (OSU Entomology) observed a heavy infestation in Tuscarawas County and beetles were collected in Toledo last season. Indeed, a specimen in the OSU Entomology collection was gathered in Cleveland in 1920. So, the historical may foreshadow the hysterical. Adults feed on tree leaves as skeletonizers, or they may be found on ripening fruit. Fortunately, they their leaf-feeding rarely cause significant plant injury; however, damage to fruits can be significant. Adults seek out turf with high levels of organic matter (e.g. thatch) in which to lay eggs. Lawns covered with partially composted manures have also been found to be highly attractive to the adults and they may burrow into cool compost piles, under decomposing manure, and into decayed mulch. It has been speculated that this attraction to decomposing organic matter explains why large numbers of adults will assail certain lawns, while ignoring neighboring lawns. Unlike other white grubs affecting turfgrass, GJB grubs create vertical burrows 10 - 12" into the soil, and they remain closely associated with their burrows. The grubs venture out at night to feed on thatch and other organic matter, and occasionally they find their way onto driveways, sidewalks, and into swimming pools, especially after heavy rains. Indeed, the huge grubs appear to practice their backstroke by employing an unusual method of travel ... they crawl about on their backs! Despite their large size, GJB grubs seldom cause injury to turf equal to that caused by other white grubs. Management efforts should focus on reducing sources of decomposing organic matter in turfgrass or in landscaping. Heavy core aeration in the fall and spring can help reduce thatch in turfgrass. Compost should be well decomposed before spreading it onto vegetable gardens, landscapes, or as top-dressing over lawns; never spread poorly decomposed manures. Lawns with a recurring beetle emergence may require an insecticide application to suppress the GJB population until other management options take effect. Insecticides that provide curative grub control such as trichlorfon (e.g. Dylox) or clothianidin (e.g. Arena) applied in early August will reduce the number of early instar GJB grubs that eventually produce apocalyptic adult appearances next year. Efficacy studies at N.C. State showed that a formulation of the naturally occurring bacterium, Bacillus thuringiensis subsp. galleriae (e.g. grubGONE!) will provide control equivalent to the curative synthetic insecticides.